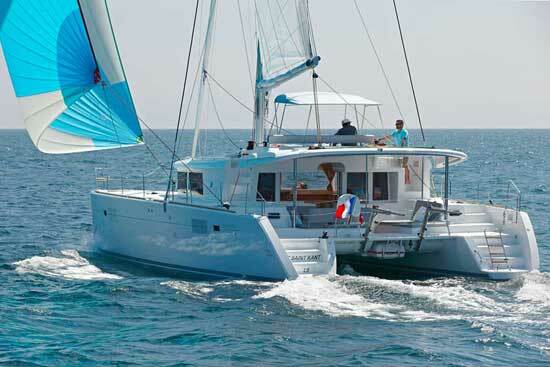 The Lagoon 620 offers five distinct cabin arrangements, each with its own advantages. Architects Van Peteghem and Lauriot Prévost joined forces to redefine a luxurious sailing platform in the Lagoon 620. In their revamp of the design, they have emphasized spaciousness and multiple layout options for a near-custom build vibe. 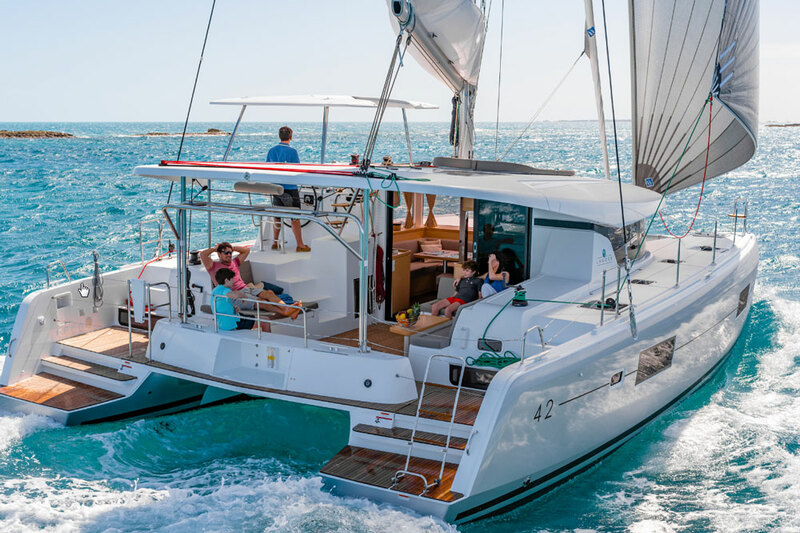 The result is a redesigned 62-foot sailing cat with easy onboard living that is ideal for coastal or even distance cruising. 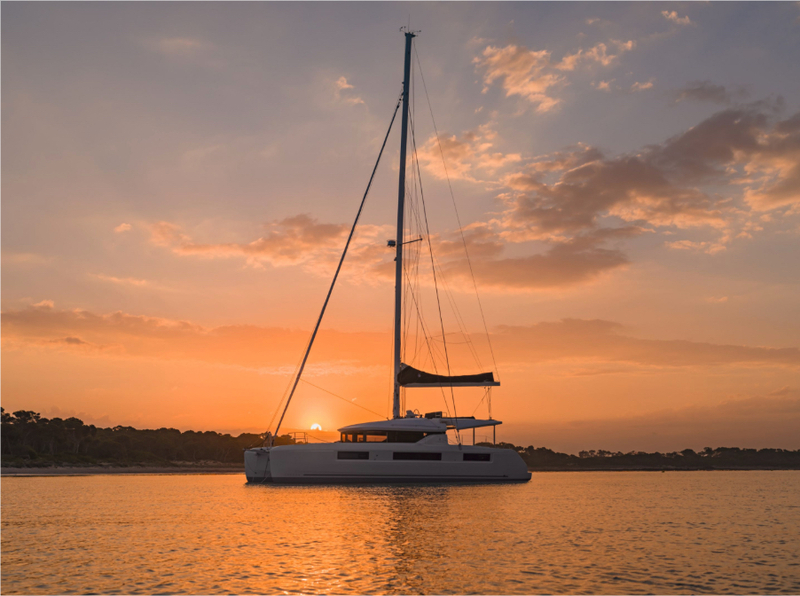 With a choice of five different layouts with four to six cabins and an equal amount of ensuite heads, the Lagoon 620 is not your typical production sailing catamaran. Owners have a say in how this cat will work for their needs. Elegance is emphasized as well. Inside, gone are the all-white composite surfaces, replaced with reconstituted Alpi wood in oak or teak, paired with dark veneer flooring. Light pours in via the vertical windows that trap less heat due to their angle, and cover up with electric drop-down blinds. 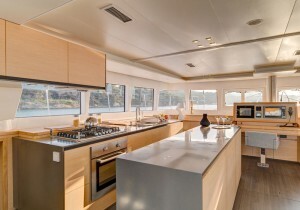 The straight-line galley to port is enormous with the sink and stove outboard, and a long island with acres of countertop space inboard. This island allows multiple cooks to work simultaneously, provides a place for extra stowage, and also helps to serve as a bracing point if it’s bumpy on a passage. 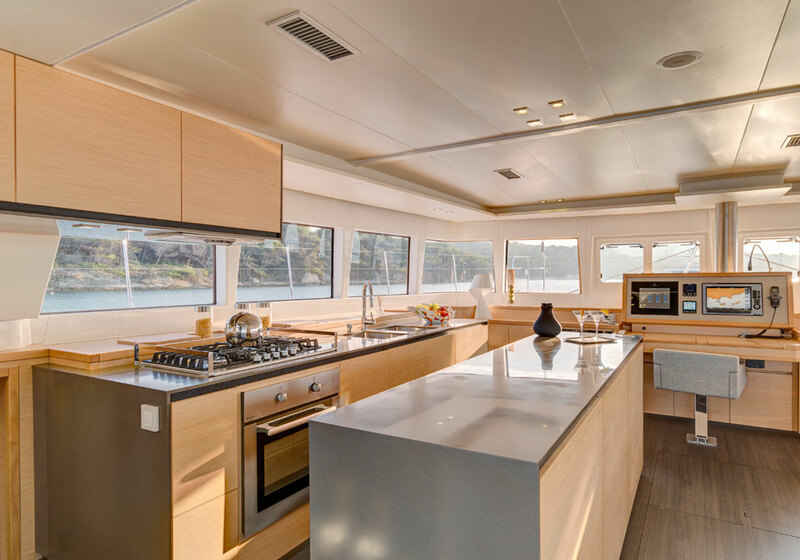 The galley in the Lagoon 620 is enormous - and smartly laid out. A forward-facing navigation station is front and center with a good view of what’s ahead and plenty of room for the installation of electronics. 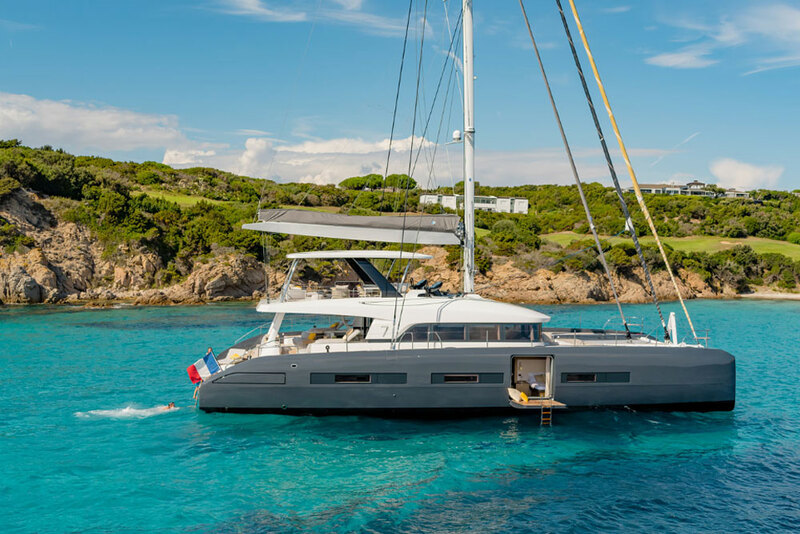 At a time when cruising cats are doing away with anything but a hint of a nav desk, the Lagoon 620 dedicates a fair amount of space to the captain’s business. The saloon can be configured with a long settee bordered by a lounge and small coffee tables, or with two hi/lo dining tables. The real dining experience, however, takes place outside in the cockpit where a large table to starboard seats eight. A lounge is just to the side of the dining seats and a wet bar may be installed in the long counter to port. The entire transom is one giant lounge with two integrated liferaft stowage cubbies that face aft. Nothing is difficult to negotiate on this cat. 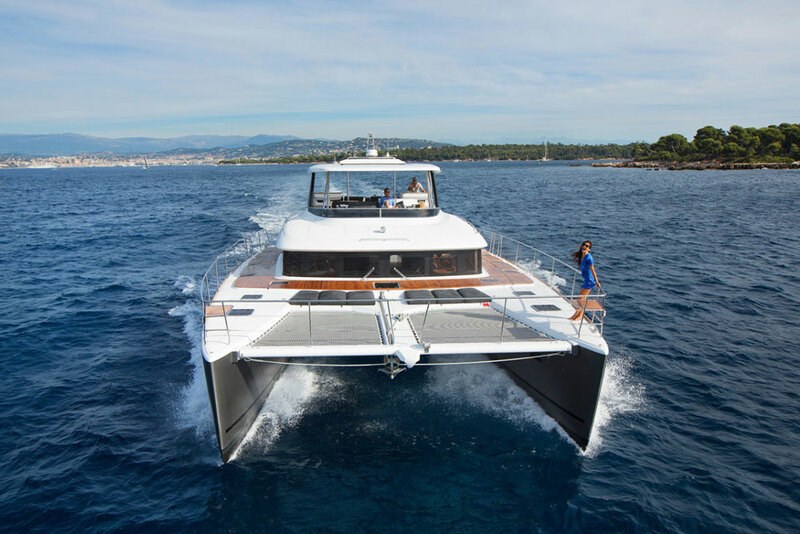 It’s easy to board the aft hulls from a dinghy or dock, and the full staircase—not a ladder—that leads from the cockpit to the flybridge is easy on the knees. Unlike other cats, the Lagoon 620 doesn’t chop up the flybridge into settees. 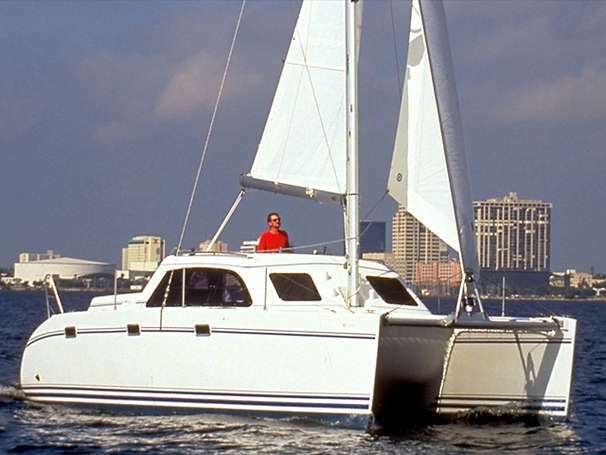 Instead, it has a full bridge with twin wheels, complete electronics in pods, an L-shaped settee to starboard, and another double sunpad amidships just aft of the mast. This area essentially doubles the space aboard and will be a favorite when it’s time to relax at anchor. The engine compartments that each hold a 110 HP diesel are far aft in the hulls, so noise and vibration are limited, and the gullwing underside of the bridge has two steps to help minimize pounding when beating to weather in a seaway. At over 70,000 pounds this is not a light cat, despite the infusion molded construction. And the hulls are broad all the way forward, so pointing to weather will be challenging. 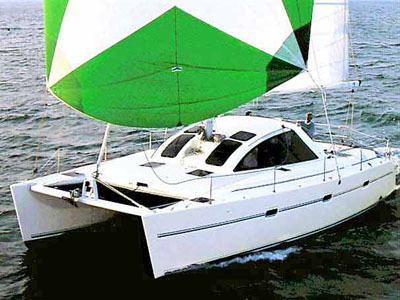 But off the wind with a gennaker, this boat should produce 10 to 12 knots of speed in 25 knots of wind. 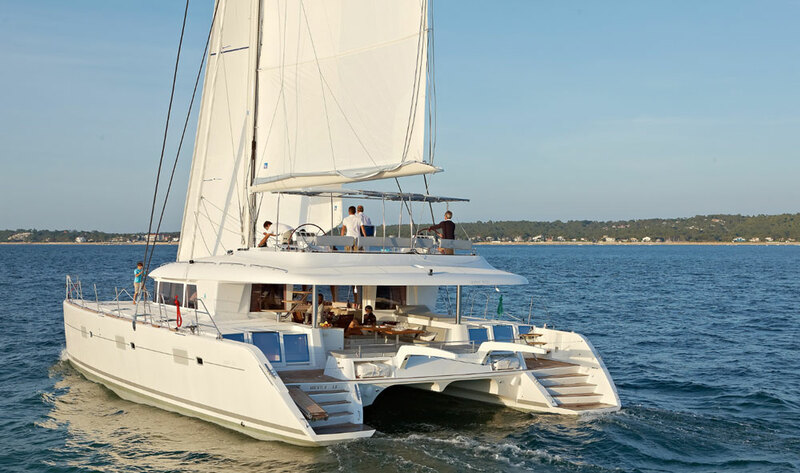 The Lagoon 620 is a big cat that can easily accommodate eight to 10 people for extended cruising. More importantly, with the amount of personalization Lagoon offers, it sets the idea of "standard production cat" on its ear. Sail Area 2,570 sq. ft.